John Gregory Dunne — journalist, novelist, and screenwriter — gives you an intimate, accurate account of Hollywood, offering a riveting expose of life and work in the movie industry. In Hollywood, screenwriters are a curse to be borne, and beating up on them is an industry blood sport. But in this ferociously funny and accurate account of life on the Hollywood food chain, it's a screenwriter who gets the last murderous laugh. That may be because the writer is John Gregory Dunne, who has written screenplays, along with novels and non-fiction, for thirty years. In 1988 Dunne and his wife, Joan Didion, were asked to write a screenplay about the dark and complicated life of the late TV anchorwoman Jessica Savitch. Eight years and twenty-seven drafts later, this script was made into the fairy tale Up Close and Personal starring Robert Redford and Michelle Pfeiffer — a "feel good" movie nothing like the grim narrative Dunne and Didion first developed. Dunne relates the saga of this transformation with a wicked eye and perfect pitch for the absurdities and savage infighting of the film business. Detailing the meetings, rewrites, fights, firings, and distractions attendant to the making of a single picture, Monster offers a revealing look at film-making — from the first script meetings to the finished products — illuminating the process with sagacity and raucous wit. 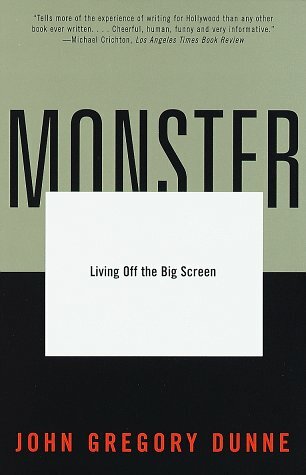 John Gregory Dunne wrote five novels, seven works of nonfiction, and two books that look at Hollywood, The Studio and Monster. Born in West Hartford, Connecticut, in 1932, he graduated from Princeton in 1954. He collaborated with his wife, the writer Joan Didion, on many screenplays. John Gregory Dunne died in December 2003.